Welcome to another trip to the edge of space—your space and mine. That’s right, we are now leaving “The Comfort Zone.” So buckle up and hang on. Actually, the ride won’t be that scary because The Man will be with us all the way. In fact, he is The Way. My comfort zone is any mental or emotional attitude other than where my Lord Jesus is calling me to go with him. It usually turns out to be a simple lack of trust in him on my part. 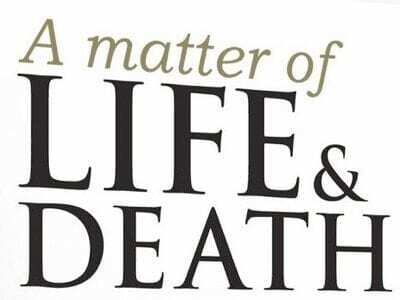 In this month, during which we this year celebrate the resurrection of Jesus Christ, we will consider the stark differences between life and death. In that vein, one of my goals is to be more thankful for each day, and even each moment, that I have to live. Surely, God and His Son have made it possible for me to live each day to the fullest—spiritually, mentally, emotionally, and physically. But, of course, the choice is mine whether to do so or not. The Lord does have a personal curriculum for me, but I must do my part in order to advance in his steps and become more like him. Some years ago I was talking by phone to my 29-year-old daughter Christine, who was living in Chicago and working with some pretty hard-core juvenile delinquents and “at risk” young people, known in some parts of the country as troubled “yutes.” She was involved with experiential education via wilderness therapy and was regaling me with anecdotes about a cross-country skiing and ice-climbing weekend with eight teenagers, a relatively harmless but very depressed group. Her last sentence resonated in my heart, and my mind immediately went to the biblical Greek word haplotes, which appears about eight times and is sometimes translated “simplicity.” It basically means “singleness of mind and purpose.” You might want to look it up, and then also look at what could be considered its counterpart word, merimnao, which means “to be full of anxiety that divides up and distracts the mind.” Christine’s statement reminded me that putting everything I have into doing anything (that is not ungodly) will help me build the habit of similarly intense focus on the most important things in my life. What might those things be? Relationships, first with God and the Lord, and then with the people in my world. Putting all we have into what we do as Christians will not be in vain because that is exactly what our Role Model did. Day by day Jesus gave himself fully, even unto giving up his most precious possession, his life. And what did God then do? He kept His promise to His Son and raised his battered, mutilated, lifeless body to newness of life, the same everlasting life that you and I are guaranteed to receive when the Lord appears. In 1967, early in my life as a committed Christian, I was in the Army and was stationed at Fort Bragg, North Carolina, where I met some dynamic saints who had quite an influence upon me. One of them was a dear man named Tommy Tyson, with whom I thereafter lost touch until my father sent me a copy of his New Life ministry newsletter, the Easter issue. After reading it, I called him to tell him how much I enjoyed it and we had a great visit. What Tommy wrote is so wonderful that I want to quote rather extensively from it and then offer some commentary on it. With the exception of Christmas, the world and the Church pay more attention to Easter than to any other time in the Church calendar. What is it all about? The Gospel of the Resurrection is NOT saying that Spring has come, flowers are blooming, and rabbits are hopping. Anyone who would let an Easter egg hunt be a prime expression of this aspect of the Gospel has missed the point. Easter is NOT an emphatic reminder that man has a soul that can never die. The Gospel of the Resurrection is something more than a renewed statement of the philosophical concept of immortality. Consequently, to present Easter as the basis of the soul of man escaping the prison-house of clay, flitting away on wings of faith (much as a cocoon breaks out of its shell), has no more to commend it from a Gospel point of view than does hopping rabbits. What in the world happened at Easter? First of all, Easter declares the open defeat of death. This Gospel is saying that The Man, Jesus Christ of Nazareth, was taken by the cruel hands of man and was given a criminal’s death. He really died; he went through the agony of it. He offered no beautiful pictures concerning death. The Easter experience declares the reality of death. Oscar Cullmann, the German theologian, in his book titled, Immortality of the Soul (Resurrection of the Dead), shows a helpful contrast between the death of Socrates and the death of Jesus. Like Jesus, Socrates was rejected by his brethren because he asked too many questions. Like Jesus, he was sentenced to die by his brethren. Socrates chose to die by drinking poison. Just before his death, he called his disciples to him and gave them a beautiful discourse on the reality of life, and convinced them, from a philosophical point of view, that death was not real. Following his discourse, Socrates drank the hemlock and went into a beautiful sleep, leaving his disciples with a peace that came through the assurance that their teacher was not dead. On the other hand, Jesus comes to his hour of condemnation and selects three of his disciples to go with him into a prayer experience. There are no words of encouragement; there is no attempt to avoid the issue. He simply asks them to watch with him for an hour. Coming to his hour of death, we see and hear the Prince of Life agonizing in prayer. In painting this contrast, Cullmann raises these questions: “Does Socrates have a better understanding of life than Jesus? Is this the reason for his calmness, and the reason for the agony of Jesus?” No, answers Cullmann to his own question. Jesus’ agony is not because he has a more inadequate concept of life than Socrates. His agony is because he has a more realistic concept of death than Socrates. The New Testament does not present death as a fair-haired angel. It is not the God-given way for man to make a transition from this world to another. The New Testament does not present death as a new birth. Death is an enemy. Anyone who seeks to evade the reality of death and its tragic consequences is failing to seriously consider the meaning of Easter…[It] is not the story of a spirit slipping out between the cracks. This is the story of the total Resurrection of the total man. If there is no such thing as actual death, the absolute end of life, then all that Jesus Christ went through in his suffering and horrible death was really not that significant, let alone monumental. The truth is that there is death after life (Have you read our book Is There Death After Life? lately?) for all who do not live until the Appearing of Christ, and that if Jesus was not actually dead and then raised to new life, everyone who has died will be gone, forever out of existence. That makes the resurrection of Jesus Christ the “crux” (literally and figuratively) of human history. “But,” some misguided Christian will say, “The Bible says that I have ‘eternal life,’ like in Romans 6:23, and that means that I cannot really die. Just my body dies.” In fact, the Word of God does not say that a Christian has “eternal” life. Modern versions may say that, but in each of its 71 New Testament uses, they mistranslate as “eternal” or “everlasting” the Greek word aionios, which actually means “in or of the age.” Romans 6:23 should read: “The wages of sin is death [the end of life—forever], but the gift of God is “age-life” [or, more readably, “life in the age;” obviously, the age to come] in Christ Jesus. So what does each of us human Christians have now by way of the gift of holy spirit? We have the arrabon, which means the deposit, downpayment, token, earnest, or guarantee as per its only uses in 2 Corinthians 1:22, 5:5 and Ephesians 1:14. The spirit of God within each of us is our indisputable proof that we will each have our name on a parking place in Paradise and that today we really can think, speak, and act like Jesus did. “What did Jesus do?” Maybe that’s what the bracelet should say. The good news of God’s Word is that a human soul (that is, a human being) has conquered death and thereby blazed a path to glory that any other human who so desires can follow and eventually end up where he is. John 3:16, Al Gore’s favorite verse (he said “John 16:3”), does not say that “God so loved the world that he put on a diaper.” No, it says that He so loved mankind that He gave His only begotten Son. Are you a parent? How do you feel when your child hurts? You hate it, don’t you? If it were possible, you would trade places with him and take on the pain yourself, right? And you are only loving at times. God IS love. How badly do you think it hurt Him to watch what happened to His Son from Monday night until 3 pm Wednesday? God knows pain and so does His Son. When we hurt, they are touched with the feelings of our infirmities, they hurt with us and they are there to comfort and strengthen us. I trust that your goal is the same as mine: to hang around until the Appearing of Jesus Christ and blast off live from the earth to meet him in the air for the world’s longest “hang time” and biggest u-turn. Never say, “When I die…” No, it’s if…” And that is a real “if.” I see no absolute guarantee that I will live one more day, and yet I fully expect to go on for a long time. Nonetheless, I really should live each day as if it were my last. How would you live today if you received a sure tip that the Lord was coming tonight? Would you “sweat the small stuff?” Would you speak the truth in love? Would you be crushed if your neighbors made fun of you? Would the spiritual elements in your life be a priority? I think you would “sprint to the tape,” giving all you have “for his sake.” So how do you know he isn’t coming tonight?